I thought about my “magic run” back in 1977, when I was on sabbatical leave at Duke. On day, when I was doing a power walk, I jogged for 3 miles for the first time in my life. That run was smooth and effortless. I felt as though I could run forever. I think everyone who’s ever run (or biked/paddled/whatever) somewhat seriously has had that day. If you’re really lucky you’ll get several of them in your life. To be fair, anyone who’s ever seen me run knows that I’ve never had an “effortless” training session in my life, but I have had a couple of days when it seemed like everything just clicked perfectly. In my case, they usually end with a violent vomiting session because as good as I feel, I’m really overheated or pushed beyond where I can run comfortably. Is that the runner’s high I’ve heard so much about? As with most of my other successes in life, good runs for me are usually fueled by spite more than anything else. I ran my best 5k on what was supposed to be a recovery day after a 10 mile run that I completely bonked on and barely finished. Luckily, I was highly pissed off at the beginning of the race and was further agitated by a jobroni (he’d later become my running nemesis) who kept passing me then slowing down and letting me pass him back. With about a half mile remaining I decided that this jerk was not going to pass me again, and I ended up edging him out by about 15 seconds to take the title in the fat boy division of that race. I’ve had a couple of training runs over 13 miles that seemed to go perfectly too. One of these runs started with all the people I was training with taking off at too fast of a pace for me–I’m very slow at the start, but usually accelerate as the run goes on and end up just kind of slow. Running alone gave me a few miles to stew, and I eventually began to boil. I think I ended up passing them somewhere around ten miles, and the site of them just fueled the fire–each mile after that got faster and faster. I actually ran a personal best for the half marathon distance that afternoon, although it doesn’t count since it wasn’t a sanctioned race. Unfortunately, it was also about 92 degrees outside. After I puked I almost passed out and had to go sit inside a nearby restaurant in the AC and sip water for about an hour. I really showed them, huh?Â Here’s some running zen to help you remember why you do it. I made a promise a couple of weeks ago that I’d be making some changes here. For better or worse, I set out to do just that last night. I committed to working through Earth Hour at least, and ended up going to bed early this morning. In lieu of turning out the lights for an hour last night, I decided to try to conserve energy in a different way. I set out to make my beloved readers have an easier time with my site by changing the theme and upgrading to WordPress 2.5 (post coming on that alone) to make things easier for myself. I think I’ve reduced my bandwidth footprint as well–eliminating a crap ton of useless images and junk. Spring cleaning for my blog. Here’s what I was able to do in a few hours: elimination of large header image, elimination of background images that I think caused issues on some browsers, and elimination of post separator images. These should not only improve load times, but also make things a little better visually. Other visual changes were to increase the width and text size of the main content area, addition of a tag cloud, and enlarging and moving the subscription button to the header. Hopefully this will boost readership too, which is a bonus for me. If I could just find a way to keep Hillary’s mug off of my site through the adsense in the sidebar without blocking all Newsmax ads, things would be much improved visually. Let me know if you’re having any problems loading the site. I’m sure hubonst will have something to say about it. This New Balance may be exactly what I need to get me to renew my relationship with her.Â It’s really good.Â There’s a whole new series of New Balance ads out, but this one is my favorite.Â It perfectly sums up how I feel about running (when I’m fit). I’ve already received a few emails about this upgrade and keeping WordPress up to date.Â First off, the one I posted about last night is a release candidate.Â I wouldn’t recommend upgrading until the new version is actually released.Â Example, I’m not running it on this blog yet, only on a development blog. When you do decide to upgrade, I recommend Keith Dsouza‘s Automatic Upgrade plugin.Â It handles all the steps required for a manual upgrade for you.Â Make sure you make a donation to his cause…this plugin will save you a lot of time and hassle.Â It even downloads the newest version of WP for you and prompts you when upgrades are available. 5.Â The only potentially tricky part.Â FTP the files for the new version to your server…DO NOT upload the wp-content directory and overwrite the one that you already have.Â It contains your theme, plugins, and images.Â If you overwrite it they’ll all be gone…good thing you backed them up, right?Â Only overwrite the contents of the wp-content folder–not the actual folders within it.Â In most cases, this is an index.php file that does nothing, and you won’t be in any trouble if you avoid the wp-content folder altogether. Â You also don’t want to overwrite your wp-config.php file either.Â This shouldn’t be a problem because there usually isn’t one that ships with the new version, but double check. 7.Â This will handle all of the upgrades and prompt you if there is a database upgrade (there is for 2.5).Â It’s a very simple process and tells you when you’re finished. How Would DLR Raise My Kids? 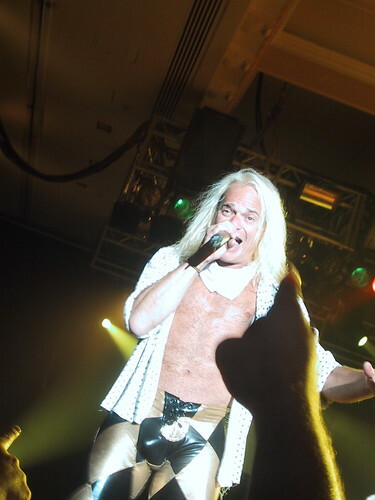 As I’ve said before, I often pause when I’m at a crossroads in my life to ask myself WWDLRD–What Would David Lee Roth Do? I guess it’s reasonable to suspect that my perspective would change once I decided to unleash version 2.0 of this gene package onto the world. Then again, when have I been reasonable? I remember reading an interview with DLR a long time ago where he described what his parents called “monkey hour” when he was a kid. He, being DLR, would act like a total lunatic for an hour.Â According to him, he took Monkey Hour and turned it into a career. I like the idea of Monkey Hour, and I think I want to have that at our house. One hour of anything goes madness (confined to one room). No rules–throw whatever you want at whatever you want, turn over the furniture and jump off it, leg drop of doom your younger siblings–whatever. Get all that energy out before bed (or a trip to the emergency room). But at the end of the hour we have to clean up everything. Making them clean up will ensure that they don’t end up like DLR. Then again, they may just end up like one of his roadies instead, huh? My buddy IB sent this article to me…very interesting.Â Netflix is running a contest for data crunchers and offering $1M to anyone (or any team) that can beat their current recommendation system by 10%.Â One of the leaders is a psychologist working by himself who is looking less at raw data and more at human nature. One such phenomenon is the anchoring effect, a problem endemic to any numerical rating scheme. If a customer watches three movies in a row that merit four stars â€” say, the Star Wars trilogy â€” and then sees one that’s a bit better â€” say, Blade Runner â€” they’ll likely give the last movie five stars. But if they started the week with one-star stinkers like the Star Wars prequels, Blade Runner might get only a 4 or even a 3. Anchoring suggests that rating systems need to take account of inertia â€” a user who has recently given a lot of above-average ratings is likely to continue to do so. “The Outlaw Josie Wales” is one of my favorite movies, but that doesn’t mean that an algorithm could spit out a bunch of westerns and give me something I like.Â Clint Eastwood movies wouldn’t do it either, but it would be a little closer.Â The real way to suggest movies for me would be to look at some other factors that aren’t so obvious.Â You need to be able to draw conclusions from my other favorites–“Fight Club”, “Pulp Fiction”, “Smoky and the Bandit”, and “Swingers”.Â You may peg all of these as “guy movies”, but that doesn’t mean I’m going to like “Gladiator”.Â In fact, I hated “Gladiator”.Â A movie like “Thelma and Louise” is a much better suggestion for me than “Gladiator”.Â Why?Â Because it is much more quotable, and that’s something my favorite movies suggest that I like. Just an example, but that’s the direction we’re going.Â In order to make a powerful suggester for anything (books, movies, music, raincoats, etc. ), it is now necessary to consider the individual making the purchase instead of a one-size-fits all approach.Â How else can you help a guy like me who hates sci-fi but loved “The Matrix” and can’t stand to watch horror flicks but has seen “Scream” several times? I’m oversimplifying it a bit, but this is a very difficult problem.Â You’re basically tasked with generalizing a solution which has to consider literally millions of individual problems within the problem.Â It’s very tough to quantify so many parameters in so many dimensions.